The study reported here follows the suggestion by Caplan et al. 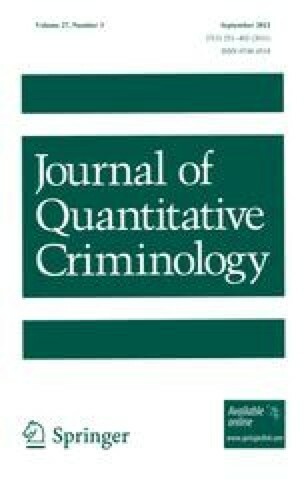 (Justice Q, 2010) that risk terrain modeling (RTM) be developed by doing more work to elaborate, operationalize, and test variables that would provide added value to its application in police operations. Building on the ideas presented by Caplan et al., we address three important issues related to RTM that sets it apart from current approaches to spatial crime analysis. First, we address the selection criteria used in determining which risk layers to include in risk terrain models. Second, we compare the “best model” risk terrain derived from our analysis to the traditional hotspot density mapping technique by considering both the statistical power and overall usefulness of each approach. Third, we test for “risk clusters” in risk terrain maps to determine how they can be used to target police resources in a way that improves upon the current practice of using density maps of past crime in determining future locations of crime occurrence. This paper concludes with an in depth exploration of how one might develop strategies for incorporating risk terrains into police decision-making. RTM can be developed to the point where it may be more readily adopted by police crime analysts and enable police to be more effectively proactive and identify areas with the greatest probability of becoming locations for crime in the future. The targeting of police interventions that emerges would be based on a sound understanding of geographic attributes and qualities of space that connect to crime outcomes and would not be the result of identifying individuals from specific groups or characteristics of people as likely candidates for crime, a tactic that has led police agencies to be accused of profiling. In addition, place-based interventions may offer a more efficient method of impacting crime than efforts focused on individuals.